Leaves: In basal rosette, simple, crowded, 20+, horizontal to erect, oblong-lanceolate in outline, 1.6 to 12 inches long, .4 to 6 inches wide, containing milky sap; margins variously lobed to toothed; terminal lobe often largest, rounded-triangular; surfaces often lightly pubescent, particularly below and on midvein; tapering at base to narrowly winged, indistinct stalk. 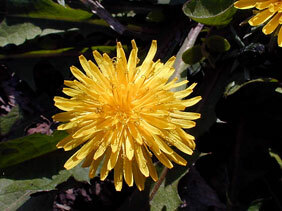 Inflorescences: Head, solitary, .4 to 1.2 inch wide, terminal on leafless flowering stalk; flowering stalks 1 to 10, erect or ascending, hollow, soft-hairy to glabrous. Flowers: Involcure bell-shaped, .6 to 1 inch tall; involcural bracts in 2 series; outer bracts lanceolate, 13-20, short, reflexed with age, sometimes purplish; inner bracts mostly 13-23, long, erect; florets ray-like, .4 to .6 inch long, 40-100+, yellow. Fruits: Achene, cone-shaped, slightly flattened, 1/8 to 1/6 inch long, brownish, tapering to thin beak, tipped with numerous white bristles, resembling ribbed parachute, enclosing small seed. Mature achenes and pappus form conspicuous balls. Habitat: Lawns, waste areas, pastures, disturbed sites, roadsides, stream banks, crop and fallow fields, damp low areas; all soil types. Forage Value: Readily consumed by livestock but provides only fair forage value. Rabbits, wild turkeys, deer and small mammals eat the leaves. Prairie chickens and other birds eat the seeds. Uses: The large taproot has been used as a coffee substitute, the flowering heads made into wine, and the green leaves used in salads. The leaves are a source of vitamin A and iron and are said to supply higher levels than spinach. Mature leaves are bitter. Native Americans used the leaves as greens and pot herbs, made a poultice of steamed leaves which was applied to stomachaches and sore throats, took a tea of the roots for heartburn and anemia, and steeped the whole plant and took the liquid as a laxative. The hollow flowering stems were made into whistles. Comments: Dandelion is an abundant weed. From French dent de lion, "tooth of the lion", probably alluding to the leaf shape.